Well thought; well said; well photographed; well done!!! Bravo!!! Thanks Fabio – have a wonderful day! Thanks joshi, we have a few of these proud toms wandering around the property. Thank you LD – do you have a holiday to compare with our Thanksgiving? No. nothing really similar here. A nice-looking turkey, for once. Happy Thanksgiving! Not exactly a beautiful bird, but majestic in his way. A beautiful picture! Thanks Mom! 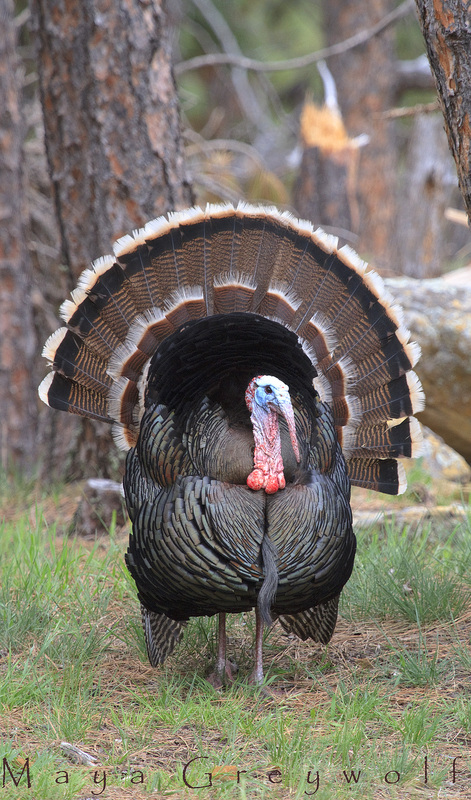 Well, he’s a beautiful turkey but it’s true, they have a face only a mother could love – lol. I understand why Turkey Vultures have featherless heads (their messy eating habits) but I really can’t come up with a reason for turkeys to be so burdened. I hope you have a wonderful Thanksgiving and I love you very much! What a handsome dude! Wow. And I agree, it’s a wonderfully easy holiday to appreciate! Sweet capture! Hope you had a wonderful Thanksgiving! And you as well! I cooked a lot of food for just four of us so I’m just now really getting to enjoy the food fest.